Apartmán Kristýna price per day from €27 Built in 2012, Apartmán Kristýna is located in quiet surroundings 4 km or a 15-minute tram ride from the centre of Prague and offers a fully-equipped kitchen and a washing machine. An airport shuttle is available on request. A restaurant and a grocery store can be found 50 metres away. Within a 15-minute tram ride from the Michelská stop you can reach Wenceslas Square. The tram stop is just 150 metres away from the Kristýna apartment. Penzion Ariane price per day from €168 Located on the outskirts of Prague, Penzion Ariane is 12 km from the city centre and 700 metres from the Opatov Metro Station. 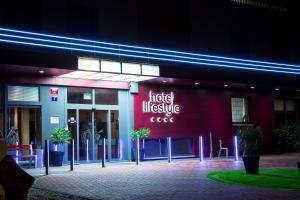 Free WiFi and free private parking are available, and the D1 motorway is just 150 metres away. The spacious studios and apartments feature a kitchen or kitchenette, satellite TV, and a bathroom. Breakfast is served in your room. The Pod Rozvodnou Bus Stop is right outside the Ariane Penzion. 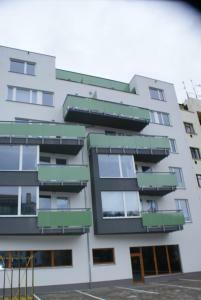 Alea Apartments House price per day from €67 Alea Apartments House is located close to the Havlickovy Sady park, 3 tram stops from Prague's famous Wenceslas Square. All apartments offer free Wi-Fi and are reachable by lift. Each unit features fully equipped kitchen. Guests can request a hairdryer and iron at the reception desk. The next tram stop is 150 metres away, but the city centre can also be reached within a 20-minute walk from Alea Apartments House. Apartments Barbora Prague price per day from €95 Located in Prague, 4 metro stops from the centre, Apartments Barbora Prague offer air-conditioned units with a terrace and free Wi-Fi access. The apartments include a private bathroom, a seating area with a TV and a kitchenette. The Pražského povstání Metro Stop is 500 metres away and metro goes 15 minutes to the centre, where many famous monuments, such as the Prague Castle, the Charles Bridge or the Jewish Cemetery, can be found. 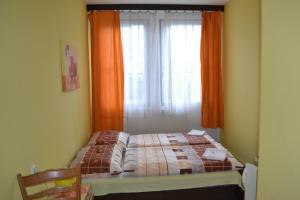 Apartmány Helena price per day from €31 Apartmány Helena is located in Prague, Czech Republic. TV and flat-screen TV are available in this apartment. 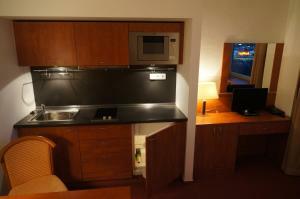 Kitchenette, kitchenware and microwave are also offered. The bathrooms come equipped with bath or shower and other essential options. 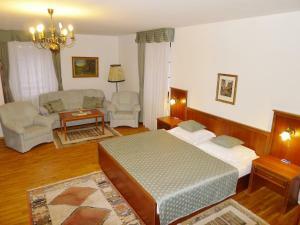 Apartmány Helena offers non-smoking rooms, barbecue facilities and garden. Hotel Apartman Student price per day from €20 Set in the university residential complex in Prague-Kunratice, Apartman Student features modern rooms; wired internet is provided in accommodation units, and public parking is available on site, both for free. All rooms are equipped with anti-allergic mattresses, a flat-screen TV and a refrigerator. Each unit also comprises a private bathroom with a shower. A functionally equipped shared kitchen is located on the floor for free guests’ use, while Wi-Fi is available in all areas for a charge. Penzion G - Centrum price per day from €14 Penzion G - Centrum offers simply furnished rooms, free private parking and a non-smoking pub serving a wide range of drinks. The Teplárna Michle tram stop of line 24 is 50 metres away. Wenceslas Square can be reached in a 15-minute ride. Free WiFi is provided in public areas and in all rooms. A small shared kitchen is available for all guests. 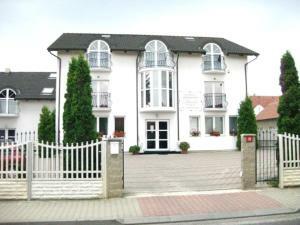 The nearest restaurant is across the street from Penzion G - Centrum. 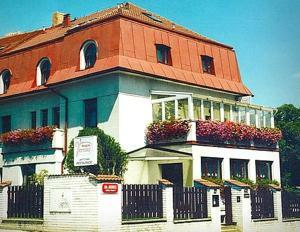 Holiday Inn Prague Congress Centre price per day from €39 Holiday Inn Prague enjoys a quiet location, a few steps away from Vysehrad Castle and Park. Vysehrad Metro station can be reached within 150 metres. The rooms are equipped with Satellite TV, a minibar and a safe. The massage room features oriental decoration and offers a wide selection of massages. 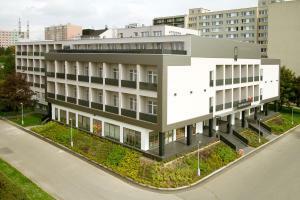 Abitohotel price per day from €16 Abitohotel’s rooms all have a private bathroom, seating area and TV. Teplarna Michle Tram Station is just 50 metres away and Prague city centre can be reached within a 20-minute ride. Each floor has a shared dining area and fully-equipped kitchen with a cooker, microwave, refrigerator and kitchenware. 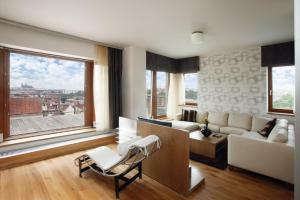 Prague city centre and Golf Club Praha are both a 20-minute drive away. Prague Castle, the Old Town, Wenceslas Square and Prague Zoo are several of the sights guests can visit in Prague city centre. Wine Pension Prague price per day from €23 Located a 30-minute tram ride from the centre of Prague, Wine Pension Prague offers a wine shop, a garden, free WiFi access and free private parking on site. The Poliklinika Modřany Tram Stop is 850 metres away. The apartment also features a terrace with views of the Vltava River, a well-equipped kitchen with oven, and a bathroom with bath tub. The Násirovo náměstí Bus Stop is 250 metres away and the Wenceslas Square is 8.